Although it may seem like I write only about the lies and ignorance of the antivaccination cult, I truly despise all kinds of pseudoscience. It’s just that refusing vaccines that prevent real diseases, based on antivaccine misinformation (OK, lies), relates directly to the health of real children everywhere. Most (but certainly not all) other pseudosciences are not that dangerous, just terribly annoying. The sudden onset of gluten sensitivity across the world is one of those annoying trends. With respect to ridiculous health beliefs and fads, I declare 2014 to be the Year of Gluten. I swear that there are more popular discussions of gluten than organic food, though I suppose that organic, GMO-free, gluten-free food would be the next billion dollar idea. Like avoiding carbohydrates, fats, GMOs, and whatever else, gluten-free diets have some relationship to real science and medicine, but it has exploded into a fad that has far exceeded the real medical issues surrounding gluten sensitivity. So what is real gluten sensitivity? Gluten is a protein found in wheat, and similar proteins found common grains such as barley and rye. Generally, we like gluten, because it gives elasticity to dough, allowing bread to have that chewy texture that is an important component of the pleasure of eating. Without trying to be a Food Network Star, gluten is critical in baking everything from bagels to cakes. Generally, kneading the dough forms long chain gluten protein molecules giving a chewier and chewier texture. Pastas, breads, and so many other foods are made through high gluten flour that is worked hard to create longer chain proteins. Yes, good cooking involves intense knowledge of chemistry. Gluten can be removed from the milled flour (or it can be added back). Purified gluten, because of its texture, is actually used to create fake meat products, so beloved (or not) by vegans. Yes, there really are people who are sensitive to gluten. Celiac disease (also known as coeliac disease in British English) is an autoimmune disorder that afflicts the small intestine of certain individuals who are genetically predisposed to gluten sensitivity. The disease afflicts between 1 in 1,750 and 1 in 105 people in the United States (or about 0.05 to 1%), a tiny number. Celiac disease usually presents, but not always, with chronic diarrhea, low pediatric weight gain, and fatigue in response to gluten. Although the disease is not completely understood, in a person with celiac disease who is exposed to gluten, the immune system causes an inflammatory reaction of the lining the small intestine. This interferes with the absorption of nutrients. The only known effective treatment is a lifelong gluten-free diet. This disease should not be confused with a wheat allergy, which is also caused by a reaction to wheat proteins, including gluten. However, there are over 20 different wheat proteins that have identified as causing wheat allergies, and gluten generally is not the cause of wheat allergy. Finally, wheat allergies are extremely rare, and the gluten form of wheat allergies is so rare that it would take a huge population to detect it. Outside of celiac disease and wheat allergies, both of which can be diagnosed objectively through comprehensive medical tests, there is a large group (by some reports, over 100 million Americans) who claim that they have some mysterious gluten sensitivity, which has a real name, non-celiac gluten sensitivity. There is some research into this potentially real or mythical condition, and there might be some small (smaller than the numbers for celiac disease or wheat allergy) number of people with a previously unknown type of gluten sensitivity, but I doubt it. Think about this–humans have evolved with cereal grains for 20-30 thousand years, so in modern human evolution, those who couldn’t consume wheat would have had lower fitness. That there are 100 million Americans who sprung from 1 mutation that caused some unknown gluten sensitivity boggles the mind–it’s just not plausible. However, once the large study is completed in a few years, maybe we’ll know of another gluten sensitivity that is supported by real science based medicine. Right now, all we have is anecdotes, which are never real scientific data. So those with a real diagnosed wheat gluten allergy or celiac disease, treatment is simple–avoid glutens. I’m guessing that this new food fad has made gluten-free diets much more accessible to people with real gluten issues, because from a business point of view, most food manufacturers wouldn’t make gluten-free foods for the less than 1% of the population who have a true gluten sensitivity. Strict adherence to a gluten-free diet may limit the amount of folate, fiber, iron and other micronutrients consumed. Compliance may be an issue since products may not be labeled correctly, or individuals choose to eat grain-containing foods just for variety. Inadvertent gluten exposure is common. Biopsy of the small intestine 2 years after adopting gluten-free diet shows tissue damage persisting in up to 50% of adults and 25% of children with celiac disease. According to one study, regular consumption of as little as 50 mg gluten, the amount found in 1/100th of a standard slice of wheat bread, damages the intestine in celiac disease. A typical Western diet contains 16 g of gluten, more than 300-times the minimal toxic dose for someone with celiac disease. This study concludes that persistent inflammation of the small intestine is associated with greater risk of cancer and osteoporosis. One of the most important considerations is that a gluten-free diet costs about $2,000 annually, more than many medications. So if you really have a real gluten sensitivity, it isn’t a matter of telling people that you have a gluten sensitivity, watching your diet isn’t a matter of anything except life or death. For those with real celiac disease or wheat gluten allergies, even a tiny amount of gluten is dangerous. And it’s not the “I don’t have energy” kind of dangerous, it could be life threatening kind of dangerous. A real physician hasn’t diagnosed the gluten sensitivity using real diagnostic tools. Once a person is diagnosed, usually during childhood, then it’s not something that becomes party conversations. One doesn’t bring up the fact that one crouton in a salad may make your intestinal tract fall out of your body into the toilet. Because that’s a real gluten sensitivity. Still chugging beers. Beer is bottled gluten water. If you drink beer, you do not have a real gluten sensitivity. Trying to “watch your gluten consumption.” Sorry, but celiac disease and real wheat gluten allergies are an on/off disease. That is, there is no acceptable amount to consume, any amount is dangerous. There are individuals who can lick a piece of bread, not eat it, and fall over sick. Again, you can’t “watch” the amount of gluten you eat, you watch for every tiny bit of gluten that may appear anywhere. Someone with real gluten sensitivities are basically obsessive about their food, because not doing it is dangerous. Bragging to someone that you’re “watching” your gluten probably means you don’t have a real gluten sensitivity. Your gluten knowledge comes from Natural News, The Food Babe, or other pseudoscience website. Your knowledge of gluten should come from your physician, preferably an allergist, and with additional information from a science-based national or international celiac disease organization. It’s easy to diagnose celiac disease or a wheat gluten allergy. If you have some other type of gluten sensitivity, it’s important that your physician establish that it is real or not related to a more serious chronic disease. You claim you feel better without gluten. Someone with a real gluten sensitivity didn’t develop it when they turned 30. It’s something that mostly (but not always) shows up in childhood, and a real celiac disease child won’t say they feel better without gluten, they’ll say how horrible it is when they accidentally consume it. It’s not some new age therapy with intangible results like “I can’t point it out, but I just feel like a new person.” Real gluten sensitivity means if you have gluten, you want to rip your intestines out of your body without anesthesia. You say that it’s easy to eliminate gluten. No it isn’t. And it’s not eliminating 99% of gluten, it’s eliminating 100% of any gluten anywhere. It’s very difficult to do. It takes time to do shopping (parents of celiac children are obsessive about food labels). It means supplementing your diet with other protein and with micronutrients that are missing when you remove the gluten. It’s asking a waiter or caterer whether any gluten products even touch the food or is used in some sauce. It’s being preoccupied with every aspect of your diet, while worrying if the next food item is going to cause massive pain and discomfort. This isn’t easy, it sounds pretty close to impossible, and that’s why if you say it is easy, you’re probably do not have any type of gluten sensitivity. So, if you run into anyone who exhibits any of those six signs I wrote above, you probably can place them into the category of mostly imaginary gluten sensitivity. It’s important to note that real gluten sensitivity is a known, real disease, and its treatment is difficult. But it is very rare, and like I said, it can be easily diagnosed. Sufferers of the disease know that there’s a difference between a tiny bit of gluten in the diet and none at all–it’s painful and terrible. Again, the benefit of this food fad is that individuals with real gluten sensitivity now have better accessibility to gluten-free foods. And that’s good. 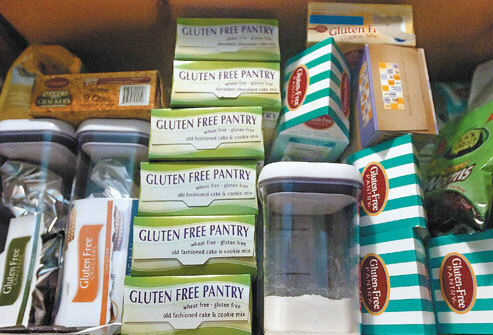 Sadly, this fad too shall pass, and then those who need it will have to search again for gluten-free foods. Editor’s note: This article was originally published in January 2015. It has been updated to improve formatting, fix dead links, and revise some points. Bardella MT, Velio P, Cesana BM, Prampolini L, Casella G, Di Bella C, Lanzini A, Gambarotti M, Bassotti G, Villanacci V. Coeliac disease: a histological follow-up study. Histopathology. 2007 Mar;50(4):465-71. PubMed PMID: 17448022. Catassi C, Fabiani E, Iacono G, D’Agate C, Francavilla R, Biagi F, Volta U, Accomando S, Picarelli A, De Vitis I, Pianelli G, Gesuita R, Carle F, Mandolesi A, Bearzi I, Fasano A. A prospective, double-blind, placebo-controlled trial to establish a safe gluten threshold for patients with celiac disease. Am J Clin Nutr. 2007 Jan;85(1):160-6. PubMed PMID: 17209192. Fasano A, Sapone A, Zevallos V, Schuppan D. Non-celiac Gluten Sensitivity. Gastroenterology. 2015 Jan 9. pii: S0016-5085(15)00029-3. doi: 10.1053/j.gastro.2014.12.049. [Epub ahead of print] PubMed PMID: 25583468. Kaukinen K, Peräaho M, Lindfors K, Partanen J, Woolley N, Pikkarainen P, Karvonen AL, Laasanen T, Sievänen H, Mäki M, Collin P. Persistent small bowel mucosal villous atrophy without symptoms in coeliac disease. Aliment Pharmacol Ther. 2007 May 15;25(10):1237-45. PubMed PMID: 17451570. Lee AR, Ng DL, Dave E, Ciaccio EJ, Green PH. The effect of substituting alternative grains in the diet on the nutritional profile of the gluten-free diet. J Hum Nutr Diet. 2009 Aug;22(4):359-63. doi: 10.1111/j.1365-277X.2009.00970.x. Epub 2009 Jun 10. PubMed PMID: 19519750.